The addition of a GReddy intercooler is one of the best ways to safely increase horsepower in a turbocharged engine. By reducing the engine's inlet temperatures, a denser air charge will enter the engine; this can make more horsepower at the same boost level and even more power at higher boost levels. 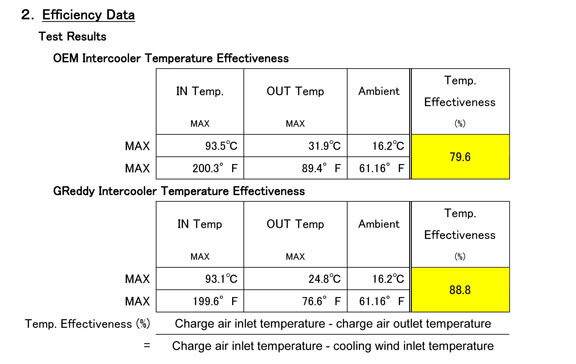 Even if there is a factory-installed intercooler, generally these stock units are not ideal even for factory boost levels. They are usually mounted in awkward locations and become very susceptible to heat saturation. They are not ideal for increased boost levels. Their vehicle specific kits include all the necessary mounts, aluminum piping, hoses, and clamps required to install the kit. All kits are designed with specific cores to provide an ideal concession of cooling and flow, with the added benefit of aggressive looks and style. This is achieved by finding an ideal position and configuration for a wide range of boost levels. One area that almost all factory turbocharged vehicles can be improved is, intercooling, especially if you decide to boost up. But even factory intercoolers at stock boost levels begin to easily get heat soaked. (when the core looses its cooling efficiency because it's volume is small and it starts retaining heat faster then it can cool off.) By reducing the engine's inlet temperatures, a denser air charge will enter the engine; this can make more horsepower at the same boost level and even more power at higher boost levels. For example on the new Hyundai Genesis 2.0T Coupe. 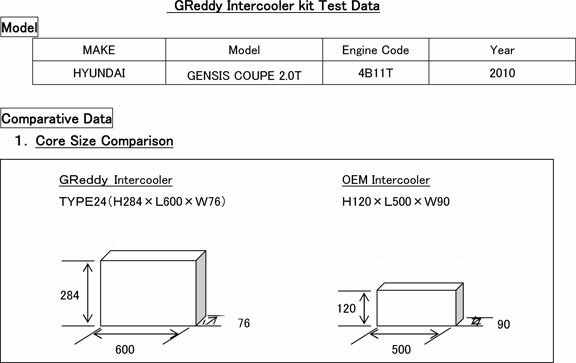 We offer our GReddy Intercooler Uprgade. First off, the kit uses a much larger Type-24 LS core which has about 60% more volume. This not only provides a bigger surface area for cooling, but also fights against heat-soak by having so much more capacity. This can be specifically translated to more reliable cooling, (in warmer weather, and for longer periods of time.) In the case of the Genesis, the intercooler is already a front-mounted unit for good air flow, but the larger size of our LS core increase cooling efficiency from 79.6% to 88.8%. That's over 12 degrees F cooler!